A music performance by Giorgis Christodoulou based on Attik’s songs. 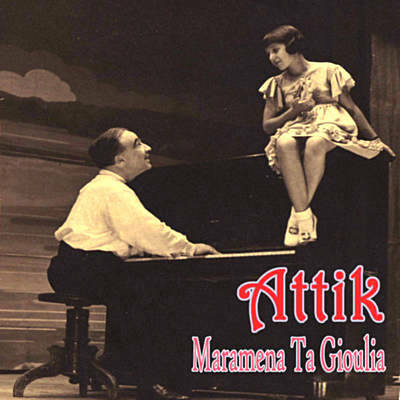 Attik (1885-1944) was a Greek song writer, composer and performer, one of the major song writers of the beginning of the 20th century. Born in Athens he grew up and had his first music education in Egypt. In 1907 he moves to Paris in order to continue he studies in law, finance and social sciences however he enrolls in the Conservatoir de Paris where he studies next to Professors Gabriel Faure, Camille Saint – Saens and Emile Pessard. In Paris he published more than 300 compositions among which works for ballet, operas, operettas, music for piano and many songs. He travelled all over the world as performer and actor until 1930, when he moved permanently to Athens and created the famous “Mandra”, his own performance hall. There he performed some of his greatest “hits” like “Ida matia” (1909), “Zitate na sas po” (1930), “Paparouna’ (1936). Giorgis Christodoulou recently discovered unknown scores of Attik. Since 2016 he travels Greece and the world performing Attik’s songs from his Paris and Athens period narrating the true stories behind each one of his songs. He is accompanied by Harris Stavrakakis (accordion, piano) and Kostas Klangos (double base).